3 Bedroom Detached House To Rent in Chichester for £2,850 per Calendar Month. An attractive Grade II Listed four bedroom detached property having been refurbished over recent years. The accommodation comprises a reception hall, access to the cellar, utility/cloakroom, study, an impressive kitchen/breakfast room with bespoke units, a Lacanche range cooker, boiling and filtered tap and central island, a second study/boot room with stable door to the garden, sitting/dining room with fireplace and southerly aspect with doors leading out to the terrace and steps up to lawn. Upstairs there are four double bedrooms, with one having a dressing area/ bedroom 5 plus an en suite bathroom, and a further family bathroom. The village of Birdham is a short distance away and offers yachting facilities at Birdham Pool. East and West Wittering villages to the south have a good selection of local shops along with the excellent beaches at Easthead, West Wittering. Chichester lies to the north, this famous Cathedral city offers extensive shopping and leisure facilities including the popular Chichester Festival Theatre, numerous restaurants and a mainline station to London Victoria. The West Sussex area hosts events including horse racing at Glorious Goodwood and motor sports, taking place at Goodwood House and the Goodwood circuit. There is easy access from this location to the A27 giving rapid road links across the south with Brighton to the east and Portsmouth to the west. 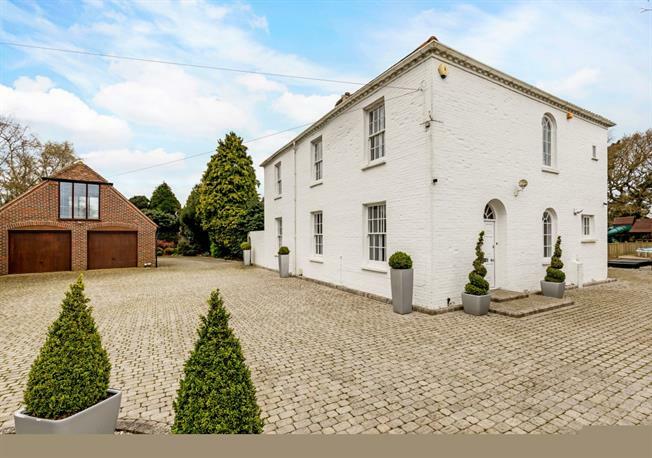 The property is approached via electrically operated double gates onto a block paviour driveway with parking for several vehicles and access to the detached double garage. There is a home office/studio above the garage. The gardens lie mainly to the rear of the property and have south-westerly aspect. Laid mainly to lawn and bordered with attractive mature trees, there is a playground area, decked area and swimming pool heated by an air source heat pump, and a two storey outbuilding in need of renovation. The whole is well enclosed and bounded with close boarded fencing.